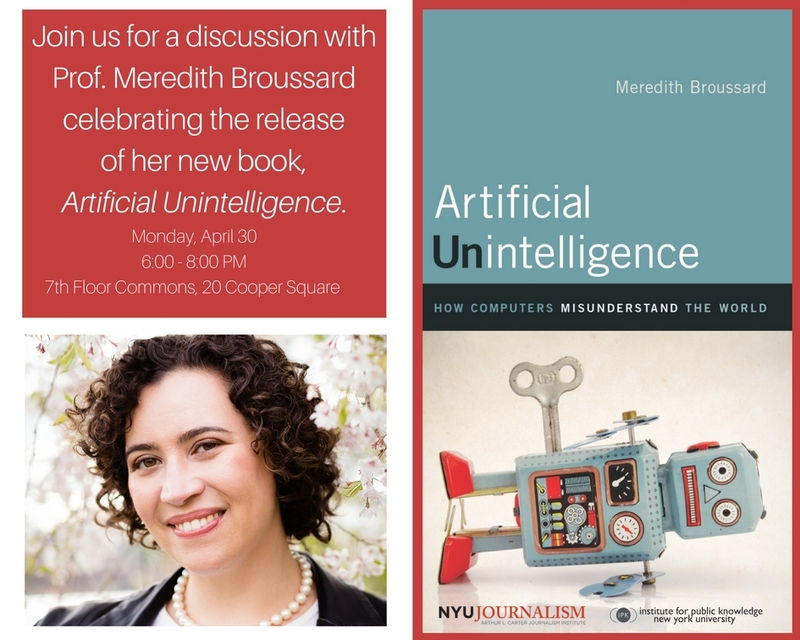 Join us for a discussion with Prof. Meredith Broussard celebrating the release of her new book Artificial Unintelligence. In her new book, Artificial Unintelligence, NYU data journalism professor Meredith Broussard argues that our collective enthusiasm for applying computer technology to every aspect of life has resulted in a tremendous number of poorly designed systems. We are so eager to do everything digitally—hiring, driving, paying bills, even choosing romantic partners—that we have stopped asking hard questions about whether our technological choices are moving us toward a better world. Making a case against technochauvinism—a kind of bias that sees computational solutions as superior to all others—Broussard explores why it’s just not true that social problems would inevitably retreat before a digitally enabled Utopia. To prove her point, she undertakes a series of adventures in computer programming. She goes for an alarming ride in a driverless car, concluding “the cyborg future is not coming any time soon”; uses artificial intelligence to investigate why students can’t pass standardized tests; deploys machine learning to predict which passengers survived the Titanic disaster; and attempts to repair the U.S. campaign finance system by building AI software. If we understand the limits of what we can do with technology, Broussard tells us, we can make better choices about what we should do with it to make the world better for everyone.